We spend a lot of time tasting and analysing the liquid – but what about the bottle that contains your favourite Scotch whisky? Have you ever thought about why that particular bottle shape and label were chosen? Ian Wisniewski reports. Learning a new language can be a slow and difficult process. But it’s quick and easy to become fluent in whisky-speak. There’s no need to learn any grammar. All that’s required is a love of Scotch whisky, which naturally prompts the right phrases and promotes a perfect understanding with everyone else who talks the talk. This means that, each time a new brand is launched, we all automatically use the same vocabulary: Have you seen it? Have you tried it? What do you think? Before tasting a new Scotch whisky, there’s the first impression, based on the name (whether a distillery or a concept) and, of course, the bottle. This could be described as the first stage of the tasting process, because how a bottle looks creates certain expectations. It’s true. Looks matter. That doesn’t mean I’m superficial – it means I’m typical. And I’m not suggesting the design has to be somehow beautiful or extraordinary. It can be understated, traditional or innovative. But it has to express something that creates a sense of connection. So, with so much depending on the design of the packaging, what does a brand owner hope this can achieve? ‘The packaging is almost the closest relationship a consumer has with a brand, apart from drinking it,’ says Peter Moore, Ballantine’s global brand director. ‘Packaging is about what you want a brand to represent. That’s a lot to incorporate, which means creating ‘the look’ of a new brand is a huge decision. Needless to say, there are trained professionals to facilitate the process. So, how does it work when a brand owner engages a design agency? Moore explains: ‘The process goes through three or four key stages. Initially, a design agency works up two-dimensional designs on computers, which produces high-quality visuals, and can take four to six weeks. ‘Then we start narrowing down the design, which is turned into a three-dimensional visual as, however good a design may look in 2D, it can be misleading, and you have to see it in 3D. ‘The next stage is to physically make a structure, usually a 3D model in plastic, which could take a few months. The final stage is a glass 3D model containing liquid, so that we have a proper prototype, which can take a few months to produce as you have to create a glass mould, test the glass to ensure it’s safe and so on. One starting point for the design process is the style of the bottle, which provides plenty of opportunities to be innovative, traditional – or a combination of the two. ‘The importance of the bottle depends on your objectives,’ says John Glaser, founder and whiskymaker at Compass Box. ‘If this is to sell extraordinary liquid to a very specialist group of consumers, then the bottle is much less important than if your objective is to develop a significant consumer franchise and differentiate your brand from competitors – then the bottle size and shape is hugely important. Bottle labels also have a strategic function. The role of the front label could be described as aesthetic and emotive, to convey a sense of the Scotch whisky, while the back label is effectively a source of information. ‘The front and back labels have to work together,’ argues Glaser. ‘Our front label designs tend to be quite unusual and can require some explanation, which we do on the back label; this is an opportunity to start a conversation and to engage people by explaining what the product is. As we’re now accustomed to seeing a far broader range of packaging styles, how important is it for a new Scotch whisky to look innovative? ‘In today’s rapidly changing market, it is vital for new products to have innovative packaging to appeal to increasingly discerning consumers,’ responds Ian Chapman, marketing director at Gordon & MacPhail. 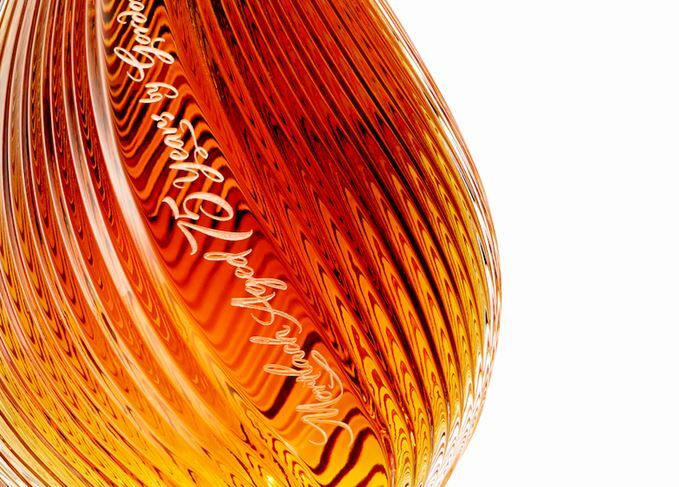 ‘We wanted the packaging of our Mortlach 75-Year-Old to be elegant and sophisticated, but it also has links to its heritage, for example with the 75 multi-level cuts in the decanter which signify each year in the whisky’s aging process. In addition to style and design, finalising the packaging also has to incorporate a range of other concerns, such as environmental issues. The process required to get a bottle onto the production line, including the label and capsules, is referred to as ‘upstream’. Meanwhile, ‘downstream’ covers the subsequent process of getting the bottles from Scotland to retailers and bars around the world. This last part of the process is equally vital – one mis-step here and all the months of hard work, from the first computer design to the finished bottles rolling off the production line, could be wasted. Celebrating the ever-popular author, seen through the eyes of his great friend, Charles MacLean.